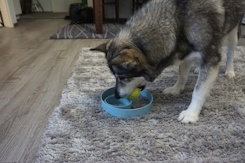 Mental activation is an important factor in order to make dogs happy. 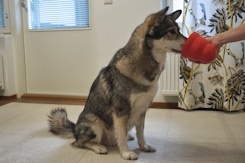 In one experiment a group of dogs were given tasks to complete in order to get rewards. 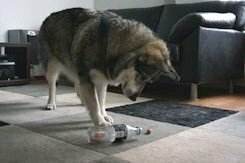 There was also a control group of dogs that were given the same rewards, but they didn’t have a chance to work for them. 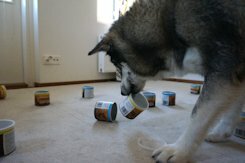 Shortly, the experiment showed that the dogs that completed the tasks in order to get the rewards were much happier than the control group that got the rewards without any efforts. You can read more about the study in here. 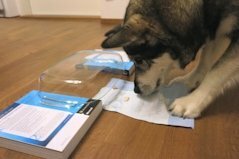 Any type of nose work games and searching games are good ways to drain your dog’s energy. 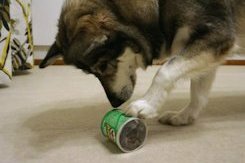 If your dog hasn’t searched for anything before, you should start by throwing a couple of treats to the floor in front of your dog so that he can see them and give a cue: search (when he goes and eat the treats). Only after this you can make the searching games harder. 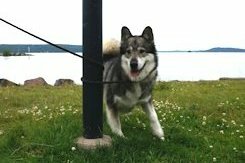 You can throw the treats on a sidewalk, or in a short grass. Later on you can throw the treats in a long grass on even in a snowdrift. 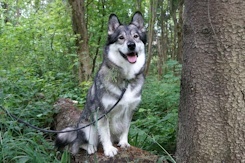 When you are outside with your dog you should always be very careful, because you can’t always be sure if there aren’t any broken glass or other dangerous things in the thick, long grass. 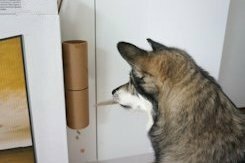 Or there could be something hidden, that you may not like your dog to eat, like used paper tissues or chewing gums. 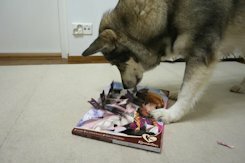 Here you can find various nose work and searching game ideas for your dog. 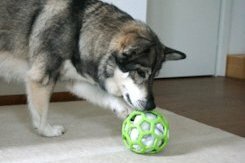 You can arrange various of problem solving tasks and brain games for your dog, and these are good ways to drain your dogs energy. 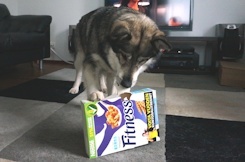 When the dog really needs to work something out in order to get his food, he will get tired. Here you can find multiple problem solving tasks and brain games as well. 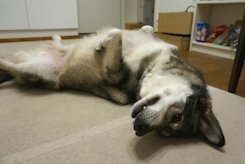 You should never help your dog with the tasks you’ve given to him, because when the dog figures something out by itself, it drains the energy and boosts the dog’s self-confidence. 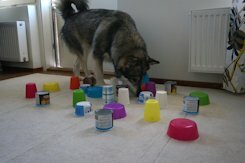 Always start with something easy enough, so your dog can complete the task without any help. 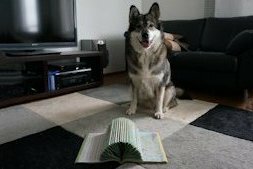 You should always watch your dog when you give him these assignments to prevent any injuries. 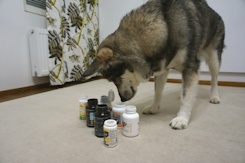 And you shouldn’t give him any toxic materials or anything with small loose parts that he could swallow by accident. You’ll get to see the full posts with more images by clicking the small icons. 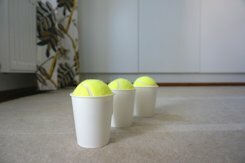 You can use any small yoghurt bottles for this game. 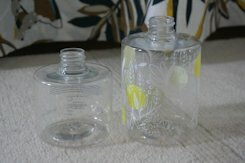 If you don’t have any carton bottles, you can use plastic bottles like Actimel bottles. 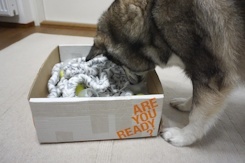 This yarn box is one diy version of a slow feeding food bowl. 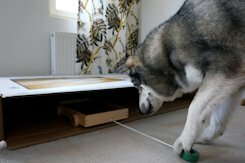 This is proper a mental challenge for your dog. This trick was one of the first I taught to Miki. Walking on different surfaces can be count as sosializing, but always when there is a chance to try something new, I adress Miki to try it. 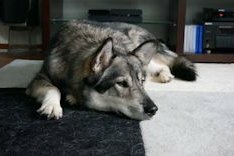 Waiting can be so hard for some dogs. 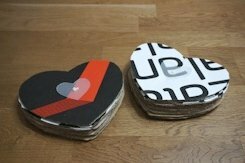 I gave Miki two of these cardboard hearts as a valentine’s day gift. 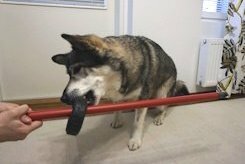 The dog is supposed to pull the towel out so he can get the treats. 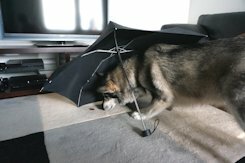 For this one you only need an umbrella and any treats. 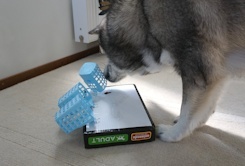 This game forces your dog to think, because separating two wash basins isn’t easy. It takes tome effort to craft the game, but the end result is worth it. 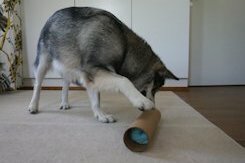 You may know the tunnel from dog agility sport. 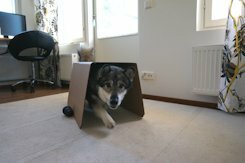 We made a tunnel from a sidetable and a towel and Miki has to crawl under the table and the towel. 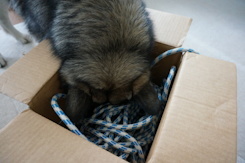 The idea of this game is to pull a treat on a rope through a lid. This is a two-part game. 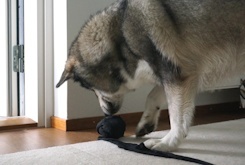 First the dog needs to pull the knotted fleece out of the toy and then he needs to dig the treats out of the knots. 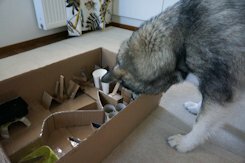 Just a few tubes and a box and you can make these fun games for your dog. 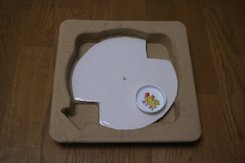 Trivets work well as slow feedind bowls. 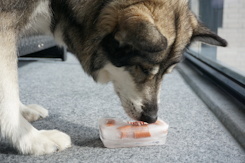 Treats frozen inside ice are the best thing that you can give to your dog on a hot summer day. 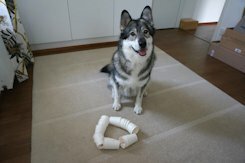 For treat wrap you need a piece of cardboard, some textile yarn and some thin and sticky treats like pieces of duck fillet or chicken fillet. For this you only need a tube, a towel or a newspaper and any kind of treats. I used pieces of dried chicken fillet. 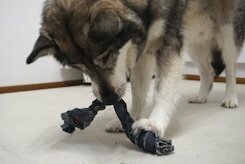 You can use old and worn out rope toys for this game. 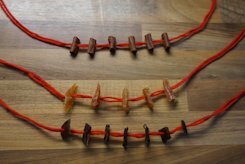 I cut a chicken fillet to thin strips and then I pushed the strips into the holes of the rope. 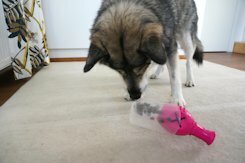 This is so cheap and easy to make and it’s as good as any food dispenser toy or even better. Working around distractions has always been very difficult to Miki. 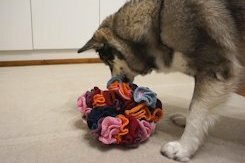 Pulling toys away from the stick gives a new kind of challenge for your dog. 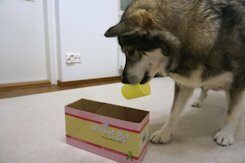 You can make a similar game as the easter egg hunt by hiding some food puzzle toys for your dog. You may wanna use a towel, that you are about to throw away. 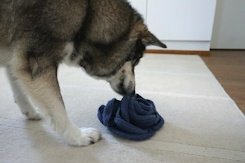 Rope toy brings new elements to towel games. 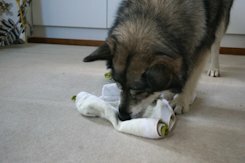 You can make lots of fun games for your dog with just a few towels and a box. Towel rockets are made with towels and cookie cutters. 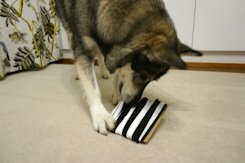 Dogs love to search because it allows them to really work with their nose. 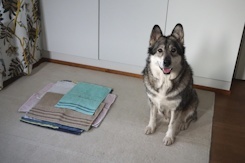 This towel lasagna is one of Miki’s favourite games. 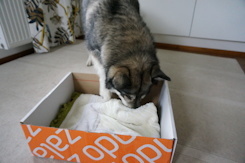 If you are about to throw away any old clothes, sheets or towels - don’t. 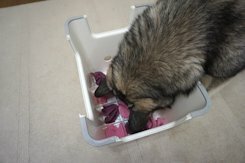 Task boxes are great for dogs that like to dig or search for their food. Also you don’t need any specific packages on items for these games. 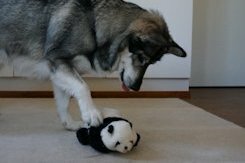 When this panda toy reached the end of his life it was still usable in Miki’s daily activation. 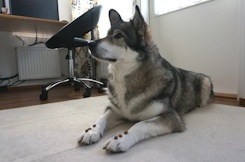 Ikea’s step stool can be used with medium size or large dogs. 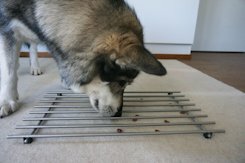 The stool has perfect grid to hide some treats when you turn it upside down. 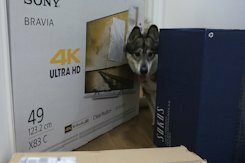 You can use any crate, drawer, table, chair or a cardboard box as a stand. 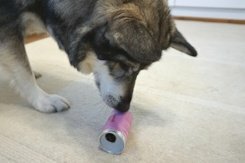 Spray bottles are outdated tools in dog training. 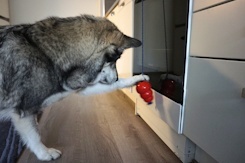 Nevertheless they are excellent as food dispensing toys. You can make amazing things out of garbage if you just use a bit of imagination. 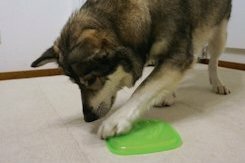 This game is suitable for dogs that already know multiple tricks/commands and who are already familiar with clicker training. 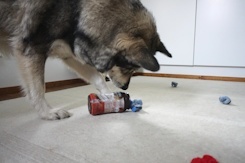 Soda bottles are great food dispensing toys because they are always available. 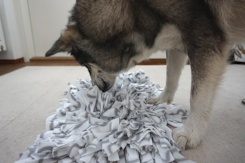 A snuffle box is a hardened version of a snuffle mat. 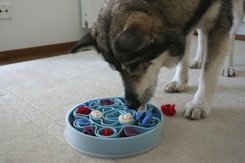 For this game you need a bowl or a basin and some treats that won’t dissolve in the water. 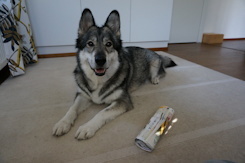 Froosh’s new smoothie cans look like they were designed as dogs’ food puzzle toys. In this post you can find various small games. 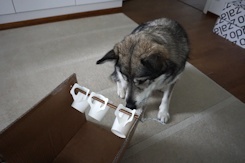 Get few cups from the kitchen or if you have small cardboard boxes or paper cups, you can use them too. 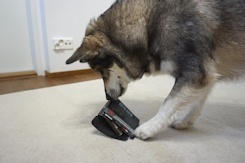 Dog really gets to use its nose when searching in the dark. 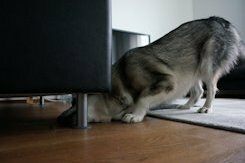 Dogs love to search because then they can really use their nose. 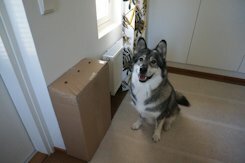 Miki loves to search his food from boxes. 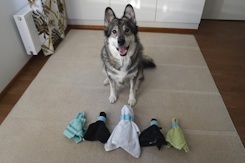 Dogs naturally follow scent traces and you can make these at your home too. 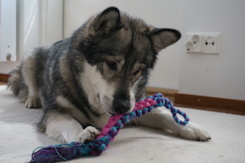 Searching kibble from a crocheted rose brings fun alteration to the nose work games. 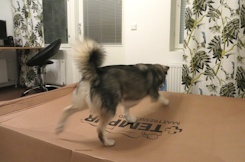 Miki absolutely loves to search for his food so I always try new obstacles with different boxes. As I was shopping, I drooled over some muffin trays and came up with an idea for this game. 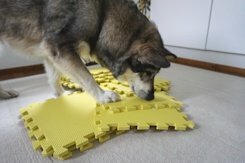 I made several fun games for Miki from these puzzle mat pieces. You can use any plastic pill jars in this game. 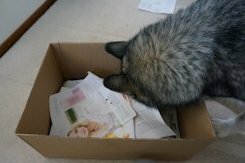 You need a phonebook or a mail order catalog and some kibble for this one. 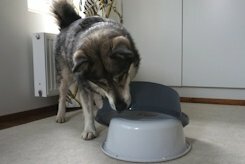 This is like a giant version of a slow feeding foodbowl. 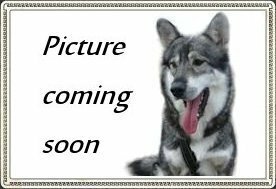 I believe every dog has an upset stomach or diarrhea at some point of his life. 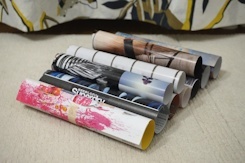 For this one you only need two or three pages from the magazine (staples taken out), masking tape and some dry treats. 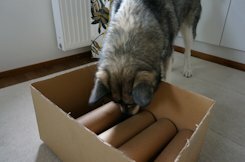 Paper rolls in a box gave Miki a nice challenge. To make paper balls, take one page from a magazine. 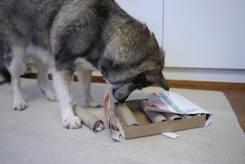 Then put some treats or just kibble on the top of the paper and then scrunch it into a ball. 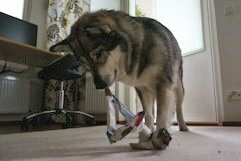 You can give paper bags to your dog to play with as long as they don’t have any metallic parts in them. This game is nice because you don’t need any expensive agility hurdles. 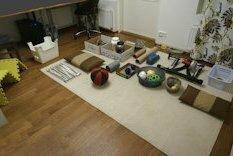 Instead you can use any light weight or soft objects you can find in your home. 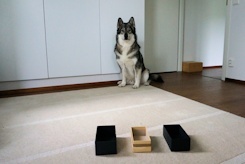 I’ve always wanted to craft this kind of box to Miki and fortunately I had some free time at the weekend. 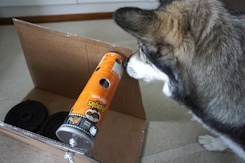 For this one you need a newspaper (staples taken out), some masking tape and any dry treats or just kibble. 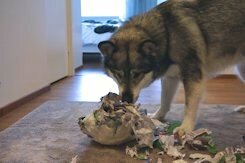 You can give carton packages as such for your dog to shred but you can create something different when you nest several packages. 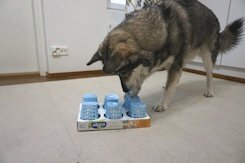 The dog is supposed to lift the obstacles out of the narrow box in order to get the treats. This game has two parts in it. 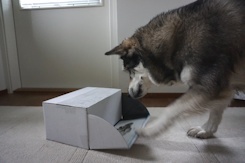 The dog needs to open the first flap of the box and after that he needs to push the box open. 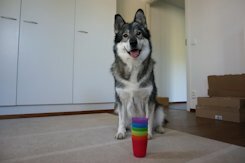 Hiding your dog’s dinner between cups gives him a nice challenge. 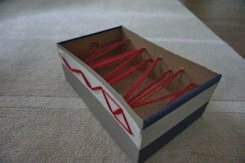 You can make a mini version of the obstacle course. You can use any lids for this game. 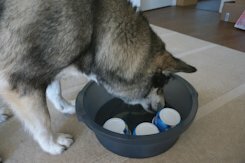 Small and light weighted lids are usually the easiest for dogs and the larger and heavier lids are the hardest. 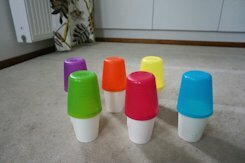 I made these lava lamp looking cones by using Ikea’s Kalas cups and paper cups. This game has similar layers as lasagna. 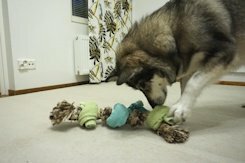 If food dispensing toys are too easy for your dog, you can make some of them more difficult by combining them with other objects. 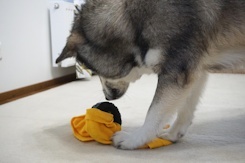 So many fun games can you create with a rubber tire toy and a towel. 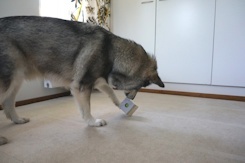 I got a dog treat advent calendar as a gift from Zooplus’ online store on last christmas. 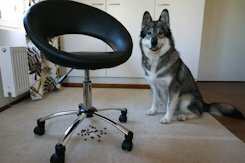 Throw the kibble under the kitchen table and under the chairs. It may sound “too easy”, but it’s not. 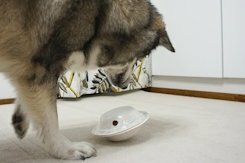 If your dog loves to chase and hunt his food then this is a perfect game for him. 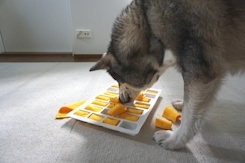 This game is easy to prepare, but it still gives a good challenge for your dog. 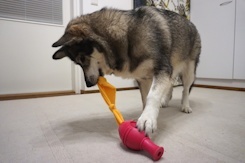 JW Hol-ee Roller toy (size L) is one of the best toys we have bought for Miki, because it’s so versatile. 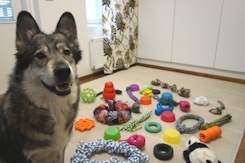 Toys for small children are mainly safe for dogs as well because they are tested for toxics (at least in Finland) and they seldom have any small loose parts. 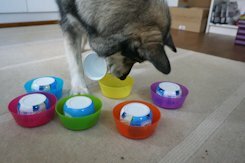 Slow feeding bowls are usually quite expensive but you can purchase this Drömmar pastry cutter set from Ikea for under six dollars. 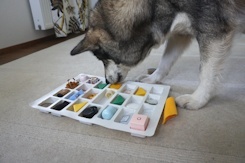 Ice cube trays are the best in those hot summer days, but you can also use them otherwise. 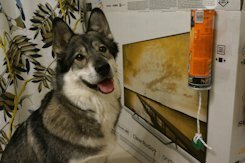 The hot-air balloon is a completely different game that Miki is used to. 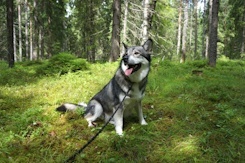 Forests have multiple times more of scents and sounds compared to residental areas. 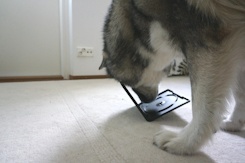 Searching the treats outside shoud begin with easier tasks if your dog hasn’t search anything before. 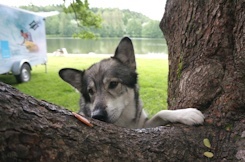 You can hide the treats under the trees bark or in the holes of the bark. 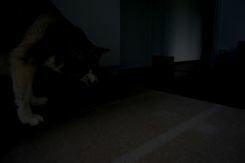 We play hide and seek with Miki every now and then. 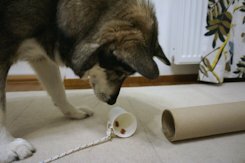 In this game a dog needs to fish a cup attached to a rope out of a plastic jar. 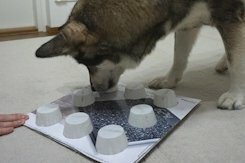 I made a diy kibble dispenser out of two deep paper plates. 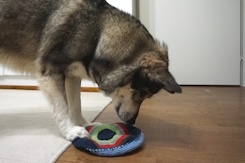 I got carried away again when I got some yarn as a Christmas present and I crocheted this flying saucer toy to Miki. I thought this would’ve been easy for Miki, but it turned out if was quite difficult. 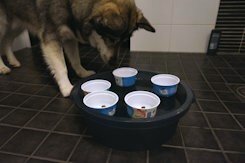 In this game the dog needs to flip the blue baskets to get the treats. 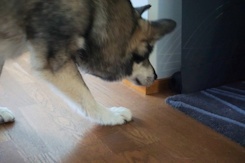 This game is convenient because you can adjust the difficulty to fit your dog’s level. 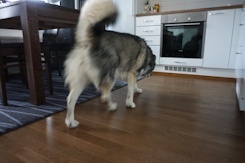 Preparing this game takes a bit time, but Miki found this game super fun so I recommend you to try this with your own dog. 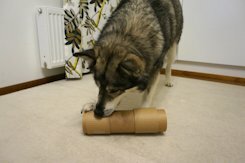 Empty paper rolls are diy dog toy’s absolute classic. 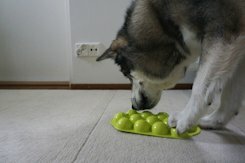 Egg cartons are amongst the classics of diy food puzzle toys for dogs. 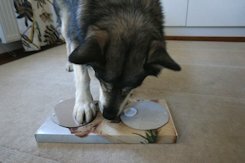 For this one you only need an empty DVD case and some treats that fits in the case. 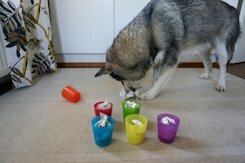 For this game you need two laundry balls and an empty paper roll. 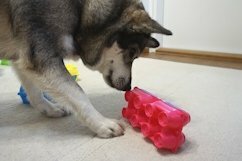 Dermosil soap bottles are shaped like they were designed as treat dispensing toys for dogs. 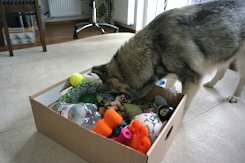 For these games you need a pair of jeans that you are about to throw away and some dry and hard treats. These games are great because you can modify them almost endlessly. Slippery basin gives an extra challenge in this treat hunt. 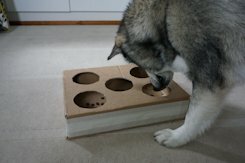 You should make the effort to build this game because it’s just so much fun to watch your dog to solve the puzzle. 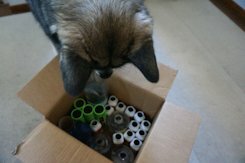 You need at least 10 carton or plastic cups and some string or yarn. 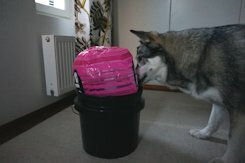 I got the idea for these baskets from Ikea’s Nordrana baskets. 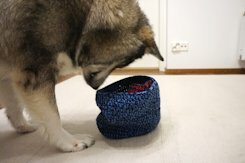 So, if you don’t want to crochet the baskets yourself, you can buy them from Ikea. In this wrap there are two pieces of duck fillet hidden under the corrugated cardboard. 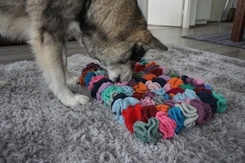 This coral mat is similar to snuffle mat, but instead of fleece it’s made of crocheted corals. I choose a Nescafe jar for this game because of the narrower section in the middle of the jar. 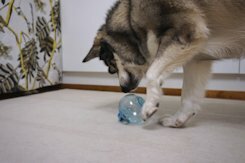 This is a confidence boosting game for your dog, by absolute-dogs.com. 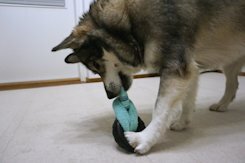 This is a great start if you need to train your dog to wear a muzzle. On our daily walks I often ask Miki to climb onto various things, such as rocks, trunks of fallen trees, stumps, benches etc. 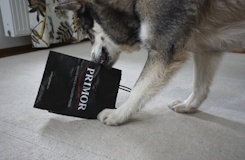 All small grocery packages are good to be given to the dog to shred. 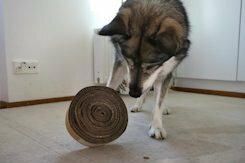 You can make a fun treat spiral out of corrugated cardboard. 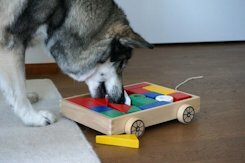 These games are quite difficult so they suit best for dogs that already have some experience with puzzle toys. 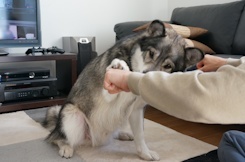 Calming down is very hard for Miki so that’s why we need to practise it. 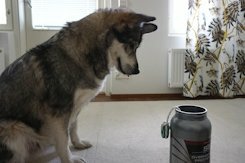 This game is for the bread and circuses - a game where your dog can win treats by playing. 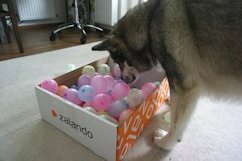 At first I thought of making a ball pool in the cardboard box, but the balls would have cost about 50 euros so I ended up improvising. 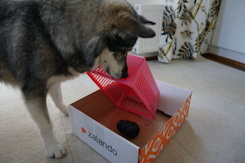 For this one you only need two baskets or boxes and any treats or just kibble. 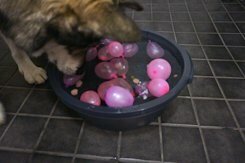 You can buy expensive ball pool balls from a toy store and pay a fortune, or you can improvise like I did. 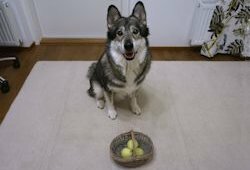 We got this basket full of delicacies as a christmas present, but it soon found its way to be part of Miki’s games. 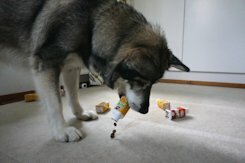 You can give empty chocolate advent calendars to your dog.